PITCHING IN. 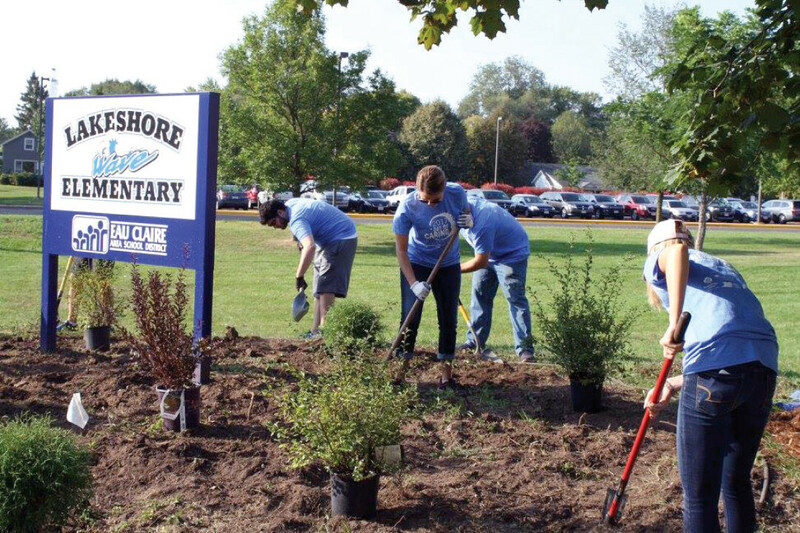 During last year’s Day of Caring, volunteers landscaped at Lakeshore Elementary, painted for the Lowes Creek Little League (below), and helped out Habitat for Humanity (further below). The United Way of the Greater Chippewa Valley will host its annual Day of Caring on Friday, Sept. 14, and this year’s event will be even bigger than in previous years. Traditionally this event is the largest volunteer event in the Chippewa Valley. Last year more than 900 volunteers took part in the Day of Caring, helping more than 40 area nonprofits and public service organizations with more than 65 projects. 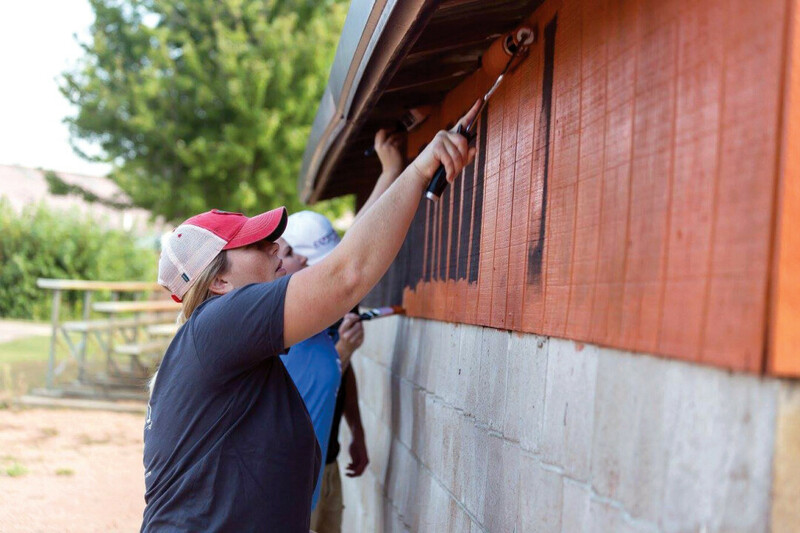 In total, an estimated 3,750 volunteer hours were given to assist with projects that otherwise could not have been completed. These projects included cleaning, painting, landscaping, construction, and tree removal. The estimated value of the donated volunteer labor last year alone would have exceeded $85,000. This year even more volunteers – about 100 more than last year – have registered to help out on the Day of Caring. Several new nonprofits have signed up to benefit from these volunteer hours. Volunteers are expected to assist with more than 60 projects across Chippewa and Eau Claire counties, according to Rebecca Baader, director of marketing and communications for the local United Way. This year the United Way will collaborate with the Feed My People Food Bank to launch an initiative to raise awareness of hunger in the community. The “Feed 60 Thousand & Tell 60 Thousand!” initiative will paint the town orange, the color that represents hunger awareness, in a number of ways. While the United Way and Feed My People have partnered on the Day of Caring in the past to host an annual food packaging event sponsored by United Healthcare, they recognize that the need in the community is in no way met by the efforts of one day and one event. As such, the organizations decided to use the day to raise greater awareness of hunger in the Valley by engaging local businesses, schools, nonprofits, media, and the community. They will do so by having all of the volunteers at 40-plus nonprofits in the community wear orange shirts, having the Phoenix Park Bridge lit orange, and having local schools raise awareness by encouraging individuals to wear orange. 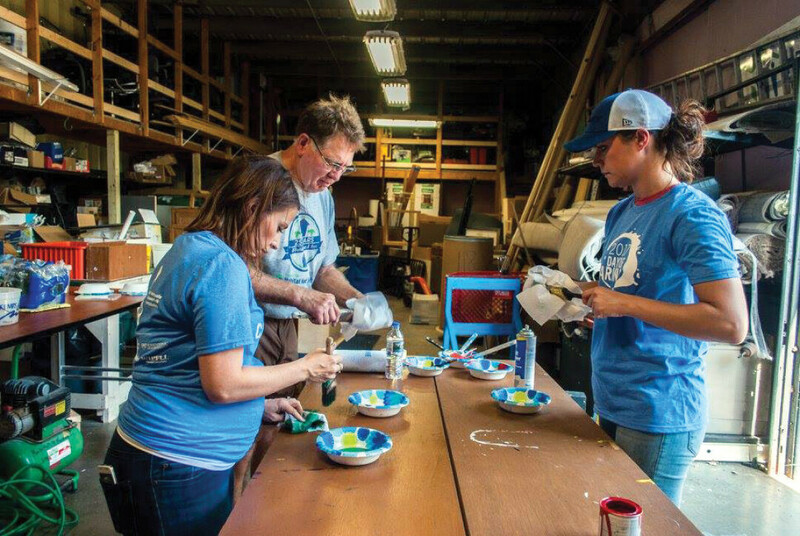 While the majority of volunteers who participate in the Day of Caring do so as part of a team from a business, individual volunteers participate in the event as well. This year’s event will include assisting with food packaging to feed local students over the weekend; painting community rooms and buildings such as the Chippewa Valley Family YMCA and Trinity Equestrian Center; sorting clothes donations at The King’s Closet Chippewa Valley; landscaping and trail work at local schools and Beaver Creek Reserve; deep cleaning at The Community Table and the Children’s Museum of Eau Claire; hanging Christmas lights in Irvine Park; and making tutus for Girls on the Run, according to Baader. To learn more about how you can help with the Day of Caring, check out uwgcv.org/day-caring.